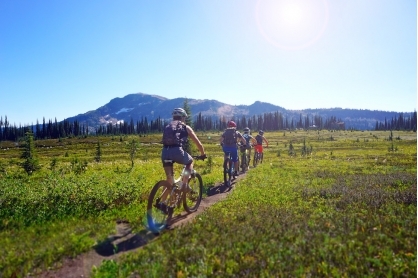 Explore the hidden gem of alpine trails at Sol Mountain nestled in the beautiful Monashee Mountains. Sol Mountain Lodge is based high in the alpine meadows of the Monashee mountains, 2 hours from Revelstoke. The trails are all specially hand built for mountain biking and are some of the most spectacular alpine singletrack in BC. The trails wander through beautiful alpine meadows, lakes and rocky bluffs. Stunning views of the Monashee mountains await you in every direction. 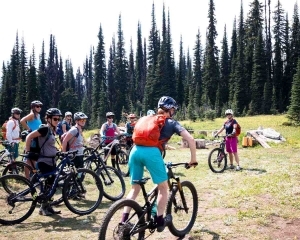 We are excited to offer this unique retreat which offers women the opportunity to experience riding in the alpine along with skills coaching, yoga sessions, gourmet meals, laughs, and a truly amazing time! Small group instruction with a maximum of 6 participants to 1 coach. 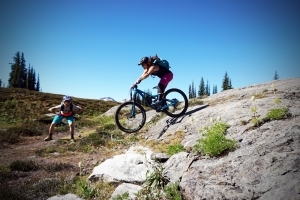 Join Sweet Skills for a fun filled weekend of mountain bike skills, alpine riding, yoga, delicious food and relaxation in the alpine. 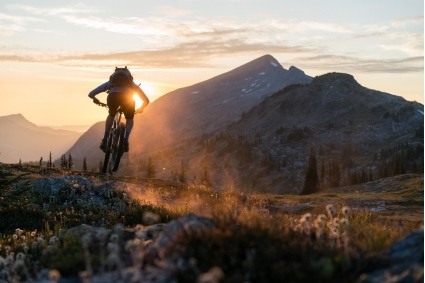 Spend 2 nights at the cozy lodge, plus 2 and a half days on your bike learning new skills and riding epic alpine trails. Daily yoga classes in the cozy lodge setting will keep us limber and ready to ride. After a fantastic day full of activity, we’ll kick back on the patio with a cool beverage and enjoy the company of new friends and amazing views. All the while, dinner is being prepared for you! 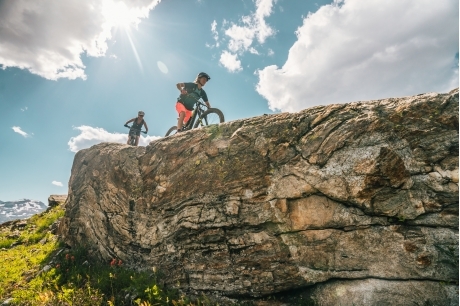 The riding terrain is intermediate with some advanced rocky bluffs to climb and a rolling technical singletrack descent. Beginner friendly options are available as well! 2 camps are offered to cover all riding abilities with specific skill focus sessions. Rides will be up to 25kms in length with lots of stopping to enjoy the views, learn some sweet new skills and have lunch at one of the beautiful alpine lakes. Beginners joining us for the 1st camp dates will enjoy learning a whole bunch of fundamental skills in a very beautiful setting. The camp is suitable for a strong beginner with some technical experience. Past beginner riders have been able to get to Sol Lake and partway to Caribou Pass. We’ll spend a lot of time on skills on the beginner friendly trails near the Lodge. Riding to the Lake on day 2 will involve some pushing the bike over technical sections but it’s totally worth it! Day 3 will be another skills day or simply a hike and canoe at a nearby lake! Groups will be split up according to riding levels and desires. Intermediate and advanced riders joining us for the 1st camp dates will be stoked with all the fun learning opportunities in the area. Day 1 we'll work on skills like cornering and getting your wheels in the air on small jumps and drops along the trails. Day 2 we'll work on technical climbing as we ride towards Caribou pass and a dip in the lake followed by a rewarding descent working on all the fun new moves you learnt on the first day. Day 3 there's options of repeating some of the favourite trails or working on more skills. Don't worry, if you're not into jumping we have a group for you! Check out our 2018 photo album here. Camp #2 Beg/Int: AUG 9-11, 2019 BOOK NOW *1 spot left! Participants are responsible for arranging their own accommodation pre- camp in Revelstoke. Packing lists will be provided. See bottom of page for driving details, participants are responsible for getting themselves up to Sol Mountain Lodge. 9:30-12:30pm Last chance ride and skills - you choose! *The drive from Revelstoke to Sol Mtn is aprox 2-2.5 hours on a bumby forest service road so a higher clearance SUV or truck is ideal. Everybody meets at an arranged location in Revelstoke and drives up in a convoy. Carpools can be arranged amungst participants if people have extra space.